Our organization is engaged in this domain, we are offering a vast gamut of I Hook that supports guy ropes, stays and cables. In the manufacturing process, offered hook is manufactured by our workforce by using quality tested material & modern techniques. 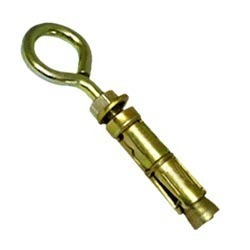 This hook is well tested on various parameters before dispatching to customers. The offered hook is available from us in numerous sizes from us at market prices. We, Trimurti Anchor Fastners, established in the year 2004, are among the prominent and topmost manufacturers and suppliers of Anchor Fasteners and Hardware Products. The product range offered by us consists of Anchor Fasteners, Metal Bolts and SS Hose Clamps. Owing to their robust construction, compact design, durability resistance against corrosion and dimensional accuracy, these fasteners are highly appreciated among our customers. For the purpose of catering to the precise needs of our esteemed customers, the offered anchor fasteners and hardware products are available with us in all the standard sizes and designs. We have been able to attain financial stability and goodwill, by meeting the diverse requirements of our esteemed customers in the most efficient manner. To ensure that the premium quality of the offered range is never compromised at our end, we follow total quality management through rigorous quality assurance procedures. We have been able to deliver the offered anchor fasteners and hardware products at the customers’ end. The top global fastener magazine has published the interview with our esteemed client "Trimurti Anchor Fasteners". Kindly update this message and the snap of the published interview in the home page of the client.
" This is an informational letter from us. Recently we were interviewed by the top fastener magazine group in the world (Fastener World Taiwan). I'm attaching a link for the above. This is to tell you the quality parameters and the name of the "ESSAR" and "AK" brands in the world, that even a Taiwanese company approached us and was forced to mention us in their international magazine. We are India's first Anchor Fastener manufacturing concern to be interviewed by them. This is a proud moment for us here at Trimurti, and we would like to share it with you. I hope this cements us for the type of vendor you are looking for. "